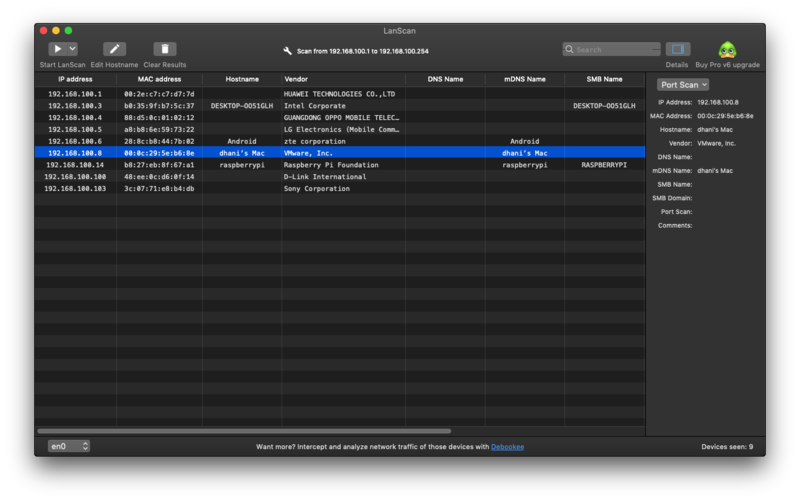 LANScan is another great IP Scanning Utility for Mac OS X. Today, I am testing the latest LANScan 6.0.4. It is a pretty cool application that shows devices that connects to our network, LAN or WiFi. In Windows, I mostly use Angry IP Scanner or wnetwatcher. These are great IP Scanning tool as well. Let’s talk a little bit about LANScan. On my previous post, I have reviewed the IP Scanner Pro, a freemium IP and Port Scanner for Mac. If you don’t want to spend any money on this kind of network tool, I would recommend LANScan. This is the best Angry IP Scanner alternative. Upon install, this software will automatically detects your network. You can press the Start button to start the scanning process immediately. There are some basic features such as IP scanning, Port scan, edit hostname and export scan result. You can download and install LANScan for free. But, if you need more features, you can upgrade to the full version. But, is it really worth it? The LANScan Pro edition will only add the hostname display. In the free version, you will only have maximum 4 hostname which displayed their full name. If you need more, you can purchase the pro edition. But, I would prefer the free edition since this feature is not really useful for me. IP Scanner Pro 3.68 – The Best IP Scanner for Mac OS X ?